I can almost guarantee your gonna have to trim the front fenders/flares to fit the 32". have ya got a pic of said silverstone look a like.....great mud tire..
First and fore most I did not write this. But I agree with every word and I thought this would be a great help for any one else looking at lift size an tire size. I found this on another forum while doing research an saved it because it is in my opinion a pretty ingenious way to build a quite able low cog big tire XJ! http://www.cherokeeforum.com/f67/low...24-12-a-32980/ Very good read, it's a lot to read an take in but well worth it for some one looking for a seriously capable rig! I didn't know that. I mean regardless of the bad blood, he still brings good points to the table. I've had both, a tall XJ with leafs all around an it was a lot of fun, now I understand being leafs springs limited it (was my first XJ build). But after that I built a much lower long arm XJ using a lot of the same things he did an sat it on 38's, fit 40's but limited travel, an it performed right up there with several other jeeps an buggies I wheeled with. One buggies I wheeled with was a full tune chassis build with an LS currie 9's atlas twin stick 44's etc the whole shabang an I could 98% of what he could. I won't ever bash some one preferred method of building, to each his own, which is why I just thought maybe some one else on here would find it Interesting as I did. I am not disagreeing with the good points of LCOG. It just isn't the only way. That is the problem there. My point then and still is, build the rig for what you want it to do. KTMRacer lives back east. The rocks are a lot smaller there than in the Sierras where I wheel. The last run I was on in August, I bounced the XJ off a few rocks in spite of my taller lift. The funny thing was the guys that were arguing with me didn't wheel. They were web wheelers. anyone recommend running 36" tires? Not on stock axles, unless they have been geared correctly, trussed, and have chromoly shafts. Swapping in 1 ton axles wouldn't be a bad idea. Thinking about installing them on xj Dana44 and gear to 4.88. Thoughts? I've looked over so many forums and I cannot find a straight forward answer. I am going to run a Rubicon Express 3.5in Super-Ride kit on my 1987 XJ. In reality this kit puts on 4.25in of lift. I'm going to use 10.50 wide tires. WHAT SHOULD MY BACKSPACING BE??? The Rubicon Express website recommends bs between 4.00"-4.75" so I decided I'm gonna get 16x8 wheels with 4.5" of bs but everyone says I'm going to have rubbing issues and I'm trying to avoid trimming. So then I decided to go with 15x8 wheels with 3.75" of bs but still people are telling me I'm gonna have issues with rubbing. Can somebody please clear the air for me? Also, will I be able to fit 265/75r16 (32x10.50) tires? On the Quadratec YouTube channel, they installed this lift and they put the same size on their XJ and didn't have to trim anything. Last edited by Ryanriddle14; 07-17-2017 at 11:28 AM. It's really gonna come down to flex. With around 4" lift you should clear those tires for street use and even if you needed to trim it would be minimal on the bottom of the front flares. Now flexing is another story. I do believe you'll be rubbing with that combination if your flexing decently. Although the main area for contact is the front lower flare/fender and is easily trimmed should you decide it's worth it and I suggest it. The bumper covers most of that portion anyway. For the bs I don't have a ton of knowledge on but can say I had 15x8 with 3.75" bs on 31x10.50s that was well clear of the control arms. It does make it a bit wide for the height and may make it contact the flare easier but if you ever plan to go higher and keep the same wheels I would stick with it so you can fit a 12.5 no problem. Although if you want to stay with the same setup the 4.5" bs should work fine and may fit the tire in the well better. 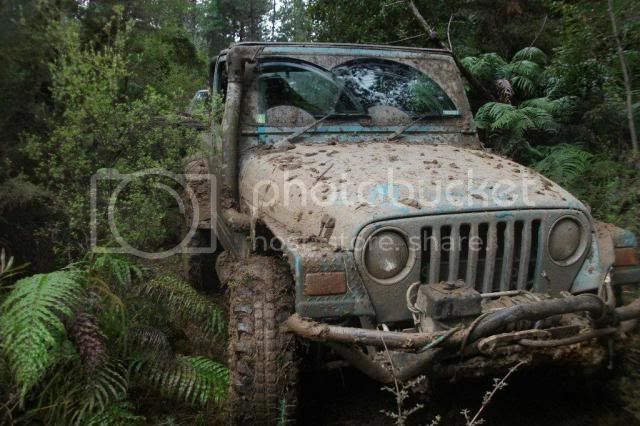 You can see my rig back when I had the 31s on 15x8 3.75" bs, and it's on the Rubicon Express 4.5" superflex kit. Which did come out higher as is just how it is with Rubicon, 5" front, 5.5" rear. It flexed well enough I had to trim a good bit for full flex, even with the 31x10.50s. And you could always bumpstop, but that would be at a premium sacrifice of uptravel. Last edited by XJ Wheeler; 07-17-2017 at 09:27 PM.